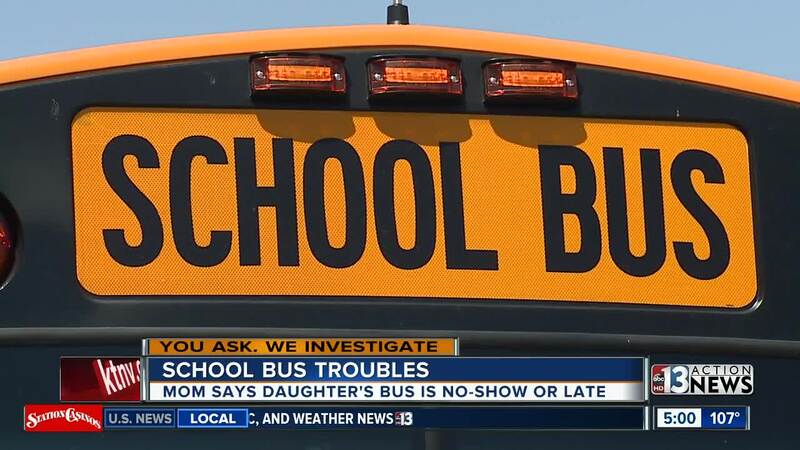 A Clark County School District parent says her daughter's bus has been late or a no-show every day since the beginning of the young school year. Megan Montes says she's getting a lesson in flexibility after her daughter's bus failed to get the 11-year-old to her magnet school several miles away from her home. "Who knows how many kids this is affecting, how many parents are not able to get to work on time or are pushing their appointments back," questioned Montes. Montes says she has the freedom to drive her 11-year-old to school for now. "I have been a stay-at-home mom for the last year and a half, but I'm going back to work on the 27th, so this coming Monday and I'm going to be really relying on that bus to be here on time so that I can get to work on time," said Montes. Contact 13 first reported a bus driver shortage earlier this month and a Clark County School District spokesperson said the staff situation remains about the same, down nearly 60 drivers. For now, the district says they have more than 90 percent of driver positions filled and they encourage anyone who is interested for a position to apply.